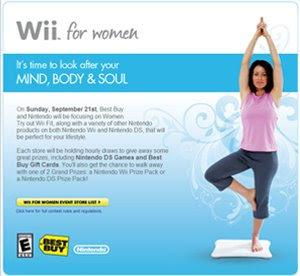 Best Buy Canada is promoting its Wii for Women event on their website. The event will take place on Sunday, September 21st at a number of Best Buy stores across Canada. Women will be able to try out the ever popular Wii Fit as well as other lifestyle products on both the Wii and DS. There will also be hourly draws for Nintendo DS games and Best Buy gift certs. Participants also have the opportunity to win one of 2 grand prizes - either a Nintendo Wii or Nintendo DS Prize Pack. Why can't we have a Wii for Women day that promotes the women who actually game. Or at least expand their buyer base without ticking off the women who game by offering them "Wii Fit and other lifestyle products" as if that has anything to do with us.